Craftin' Caro: Last day for fabulous Starter Kit special! Last day for fabulous Starter Kit special! TIME TO GRAB IT NOW....your Canadian stamping starter kit is 15% off, but TODAY is the final day to get it at its special $225 price + free shipping + no GST! 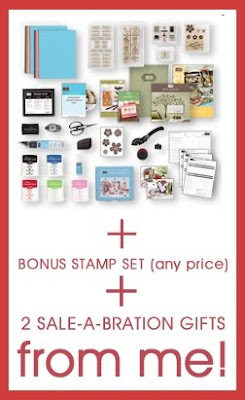 Sign up today and receive not only your free bonus stamp set of ANY PRICE from Stampin' Up!, but you will also receive a special bonus from me of *2* Sale-A-Bration stamp sets (or the paper package or new border punch) -- you pick! Click HERE to learn more about what's included in your customizable Starter kit, valued at about 60% off regular price. PERKS? Click HERE to read about some of the great advantages of being a Demonstrator! GOT QUESTIONS? Drop me a line and I'll answer them for you!